After leaving difficult conditions in her home country, senior Jennifer Martinez de Pinillos aspires to pursue a master's in nonprofit management and own her own shelter one day. Nearing the end of any collegiate journey is typically a joyous time for most students. After years of juggling classes, working on projects and studying for exams, the end goal — a degree and chance at a better future — is within sight. However in 2016, when clinical psychology major Jennifer Martinez de Pinillos was planning to graduate from Arturo Michelena University of Venezuela’s Carabobo State, she instead had to prepare to uproot her entire life and family to a foreign country. de Pinillos, along with her parents and younger brother and sister, are a just a few of the 3 million emigrants from Venezuela who have fled their native country due to worsening economic, social and political conditions. During the past two years, hyperinflation in the nation, which is now estimated to be more than 1 million percent, has made it difficult for citizens to get food, medicine and other essential items. A cup of coffee there now costs 2.5 million bolivars. “When you grow up in a country, you never expect to leave. Because of [circumstances] you have to leave everything, even your dreams. I was about to graduate there and I had my plan for life,” de Pinillos says. That plan was to pursue a master’s degree in her country’s capital of Caracas and to work for the U.S. embassy in Venezuela. But just like de Pinnilos’ life, her dream has changed entirely. Soon to graduate with her bachelor’s in clinical psychology from UCF, she now plans to return to the university to pursue her master’s in nonprofit management. de Pinillos says she hopes to one day own her own nonprofit shelter and help provide essentials for those in need. “I know from the Venezuelan and American perspectives if you don’t have the basics you cannot dream. You can’t expect to go to college if you don’t have food, if you don’t have anything to wear. I want to be able to give all those things to people so they can dream again,” de Pinillos says. Since coming to Florida, she has already put this focus to use by helping those back in Venezuela. de Pinillos and her family periodically send boxes of clothing, medical supplies and other necessities to the church they attended, along with nearby orphanages. In the two years they’ve been here, they’ve sent 20 boxes of donated items from friends, community members and themselves to those in need. “My desire to help came from [living in] Venezuela. By helping Venezuelans from here, I discovered there are communities in the U.S. that are helping [elsewhere,]” she says. Although her mom, Aury Garanton, says her daughter was always looking for ways to help others, remembering conditions in Venezuela helps de Pinillos keep her focus on her home country. Her family lived in Valencia, an industrial city that is considered an economic hub. Her mother was a medical translator who would often travel to the United States for work, and her dad was a real estate agent. Although her family was better off in some ways than many other families, it was the violence surrounding university protests in the nation that caused them to move. “In 2015 there were more protests so my mom and dad started to say we couldn’t stay anymore,” de Pinillos says. In the year before that, Geraldine Moreno, a fellow classmate, was assassinated by National Guardsmen outside her home for protesting. The school that de Pinillos’ brother attended was at the center of the university movement opposing the government. During these times, de Pinillos and her family, along with other Venezuelans, would experience guarimbas, or blockades. Citizens would use trees, tires and whatever other items they could find to block the roads to prevent colectivos, armed pro-government groups that attack protestors, from raiding homes and harassing people. “It’s very hard leaving your family, friends and everything you’ve built for years. But life is about what is ahead. You can build anywhere you can go,” her mother says. During that building process, it’s been challenging for de Pinillos to adapt to the culture of her new home, she says. But by watching the TV show Friends to get familiar with the American sense of humor and making friends in her classes, she’s overcome this. When she first came to UCF in Fall 2017, she struggled with adjusting to the education system in the United States. In Venezuela, bachelor’s degree programs typically take five years to complete. Universities there determine every course students must take in that time, with no general education classes or choices for electives like in the United States. Karen Cox, director of UCF’s Psychology Advising Center, met de Pinillos at orientation and has stayed connected with her since to ensure her success. Cox says her department’s willingness to work with transfer students allowed her to substitute many of de Pinillos’ previous courses to fulfill UCF’s graduation requirements. 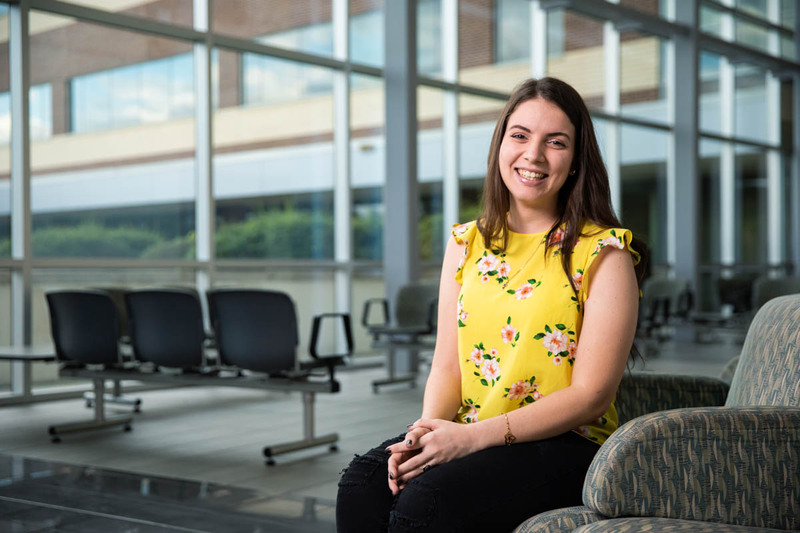 de Pinillos plans to carry that ambition forward into her graduate studies and pursuits after graduation to help better the world, but she credits her experience at UCF for providing the foundation on which she’s been able to build her new dream. “When I came [to Florida] my concern was, ‘What am I going to do?’, [but] my journey at UCF has allowed me to encounter myself and know who I really am, what I really want and what I am capable of doing,” de Pinillos says.